We present a variant of the approach to the assembly line balancing problems, with the aim of reducing the ergonomic risk for operators of mixed-model assembly lines (MILP-3). Specifically, the MILP-3 model is focused on minimizing the average range between ergonomic risk values of workstations. Using a case study from Nissan’s plant in Barcelona, not only are the differences between levels of ergonomic risk of stations reduced, but we attempt to reduce the average maximum ergonomic risk of the assembly line. The new model is compared with two others, MILP-1 and MILP-2, which minimize the average maximum ergonomic risk and the average absolute deviation of the risks, respectively. 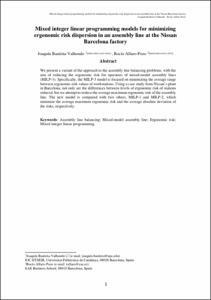 Bautista, J., Alfaro, R. Mixed integer linear programming models for minimizing ergonomic risk dispersion in an assembly line at the Nissan Barcelona factory. "Dirección y organización. Revista de ingeniería de organización", 31 Juliol 2018, vol. 65, núm. 2018, p. 72-89.